Indiana Jones is one of the most beloved movie franchises of all-time. And while the four films have inspired several trading card sets, including five from Topps, the whip-toting, hat-wearing, snake-fearing adventurer is still largely overlooked in the hobby. 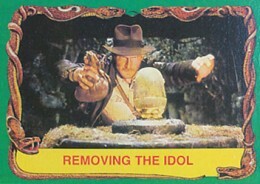 1981 Topps Raiders of the Lost Ark, the first set of Indiana Jones trading cards, remains extremely affordable. The 88-card set offers a fun and comprehensive look back on the film. The first card is a header that introduces the film, hyping up the dream team of George Lucas and Steven Spielberg. The next four cards are character profiles, looking at the film's lead characters: Indiana Jones, Marion Ravenwod, Rene Belloq and Sallah. Until the final checklist, the remaining 80-plus cards focus on retelling the film's story. From the rolling boulder at the beginning to the action of the closing sequences, 1981 Topps Raiders of the Lost Ark is about as comprehensive as one could expect from a set of trading cards in this regard. 1981 Topps Raiders of the Lost Ark card fronts are easily recognizable thanks to their bright green outer borders. Story cards also use a snake to frame in the photo. A yellow ribbon along the bottom offers the card's caption. Card backs carry a lot of text inside a yellow box that is surrounded by a red frame border. 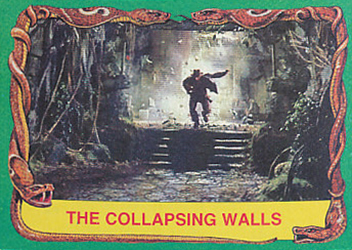 The Raiders of the Lost Ark logo is at the bottom of the card along with a prompt to continue following along on the next card. 1981 Topps Raiders of the Lost Ark is still quite cheap despite the number of years since it was released. Sets and even unopened packs and boxes can still be found without much effort. Because the cards are so cheap, single cards can be a little trickier to find though for those looking to finish sets or upgrade well-loved cards from their youth. INDIANA JONES RAIDERS OF THE LOST ARK MOVIE 1981 TOPPS BASE CARD SET OF 88! 1981 TOPPS RAIDERS OF THE LOST ARK COMPLETE SET HIGH GRADE MINT! 16 Escape to the Skies! 26 Marion in a Jam! 27 Jones to the Rescue! 28 Struggle to the Death! 33 Fleeing the Blazing Inferno! 35 Attacked by Arab Henchmen! 44 Indy and Sallah...In Disguise! 58 Trapped in the Well! 64 Marion Holds Off the Enemy! 67 Where There's Smoke, There's Indy! 69 Race for the Ark! 73 Indy Hitches a Ride! 84 The Ark Is Opened! 85 The Power of God! 86 The Adventure Ends...Or Does It? Vintage RAIDERS OF THE LOST ARK - 1981 - Complete set of 88 Trading Cards. 1981 Topps RAIDERS of the LOST ARK Trading Cards Box of (36) Packs! 1981 INDIANA JONES RAIDERS of the LOST ARK UNOPENED BOX OF 36 PACKS BEAUTY! !